Soon we begin the celebration of Sukkot, and the heart of Sukkot is the mitzvah [commandment] of hospitality. LIFE AND DEATH – Hospitality in the Bible was not just being friendly, or inviting people over. If travelers could not find a safe place to rest, they could die. It was part of the social contract of the wilderness to welcome strangers. It was also part of that contract for strangers to behave themselves as guests. In much of Jewish history, Jews were not safe except in the homes and settlements of other Jews, and so it has remained a sacred duty to care for visitors, and to cherish hosts. THE SUKKOT CONNECTION – I believe that Sukkot can play a special role in bringing hospitality back to the forefront in Jewish communities. During Sukkot, we don’t entertain in our houses, we entertain in the sukkah. 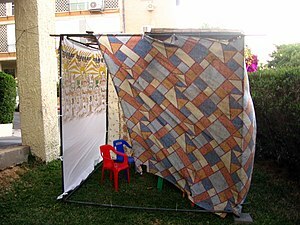 It might be the sukkah at synagogue, or it might be a makeshift sukkah in our yard (for more about making do without a real sukkah, see my article Sick of Synagogue). True, some people have fancy sukkahs, but even the fanciest ones look pretty ridiculous. Sukkot takes us out of our homes and into the sukkah, where we can warm up to the idea of traditional hospitality. The simplicity of the sukkah reminds us that human interaction is more important than the furniture. THE HOST – A Jewish host is responsible for making her guests welcome, and to see to it that they are not embarrassed in any way. It’s good to offer food or something to drink if that is possible. The host also watches out for the emotional comfort of guests. THE MAIN THING – Rabbi Nachman of Braslav said, “All the world is a narrow bridge; the important thing is not to be afraid.” It is easy to get stuck thinking that I don’t want to have anyone over because my apartment isn’t nice enough, or my cooking isn’t fancy, or because I fear some other judgment that a guest may bring. To conquer these fears, start small: invite someone to a Sukkot picnic, or invite someone you are sure will be kind. If they say “no” don’t take it personally – people say “no” for a lot of reasons – but invite someone else. If you really can’t see opening your home, invite them for coffee! But I challenge you (and myself!) to use this Sukkot as a time to reach out to other Jews. And if you have a big success, come post in the comments. If it’s a disaster, yell at me in the comments!